Die Hard is Gord's favourite Christmas movie. 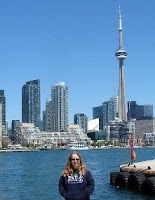 It was playing tonight at the Hot Docs Ted Rogers Cinema (Bloor Street W/Bathurst Street) and was a "quote-along". This is the third year in a row we've gone and it's always fun! It’s just not Christmas on Bloor Street without a visit to Nakatomi Plaza. This year, we’re blowing the roof off with a special quote-along edition. Kick off your Christmas with a night filled with audience participation, festive drink specials, a hilarious pre-show and more. That’s right, Hans - we have the detonators! 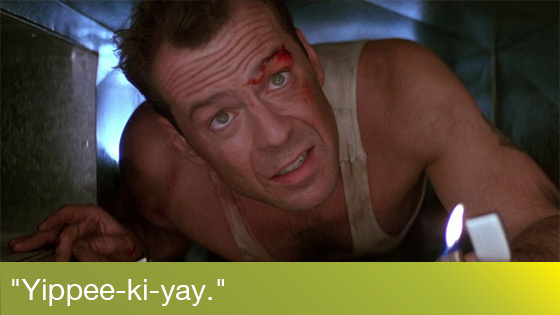 Bring your friends and family (but leave the younger kids at home) for Die Hard on the big screen, with the sound cranked and subtitles for quoting along. They gave out prop bag full of goodies with a candy cigarette, chewy candy toe and a sucker. We'd bought the combo for $18 which included the movie, a tallboy can of beer and a medium popcorn ... what a great deal! Gord gave me his beer (thanks, Gord!). Before the movie started, they showed clips from various Bruce Willis movies and Die Hard-related stuff. Thomas Rivas was the emcee. He was more organized last year and the year before giving us instructions on what to yell and when. For example, we were supposed to be instructed to yell "Merry Christmas" every time we saw a Christmas tree, "shoot the glass" when the bad guys spoke in German and "Where's the News?" when Huey Lewis look-a-like Eddie was on the screen. Those of us who have been to the quote-along before knew when to yell stuff. There were subtitles on the bottom of the screen and we were encouraged to say them with the characters and yell at the characters when we felt like it ... which we did (it was a fairly lively crowd!). At the end of the movie, just before the credits, everyone stayed around to sing along to Let it Snow! Let it Snow! Let it Snow!. It was a fun night and has become a holiday tradition for Gord and I! Sounds like so much fun! Merry Christmas!